Congratulations to Elise Lovell and Betti Smith who were winners at the annual Havant Borough Sports Awards. Elise won the Senior Sportswoman of the Year and Betti won the Junior Sportswoman of the Year. The evening was hosted by Andy Moon who is South Todays sports presenter for BBC Radio Solent. A very successful awards evening, well done to all award winners and nominees. Thanks to Sue Dewar for presenting the awards, Pete Spencer for stepping in at the last minute to do the announcing and to Julie and Hayley for organising the whole event. A special thank you to Corin for the hours she spent in preparing the power point presentation, unfortunately this was unable to be shown on the big screen due to a technical problem! Full results are now available on the Hampshire Athletics website. The address considered too long to be delivered on the night; shortening not an option. Thank you all for coming and showing that you have found friendships and shared so many pleasant Club memories over the decades, and that there was little fear of starvation if we were to be locked in the pavilion for a week or so, with the large amount of food brought, well done everyone, and thanks Sue Hitchings for the magnificent cake. 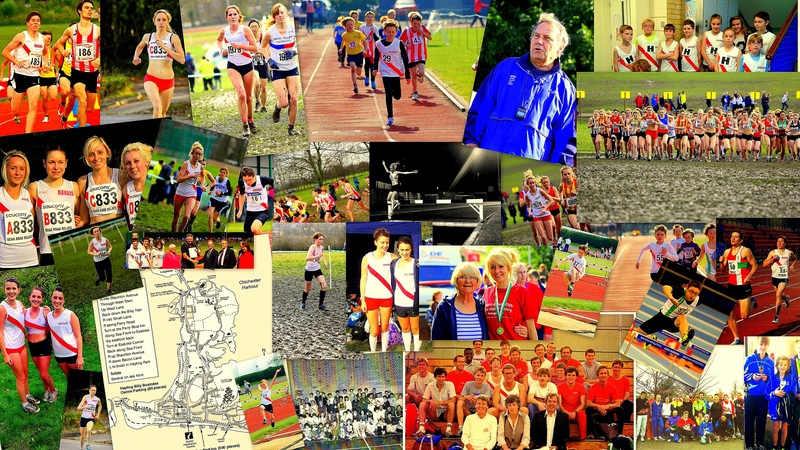 On the 12th October 1978, a few parents of athletes put their hands into their pockets at Dave Ellis’s home in Warblington and the Club began, training at Warblington and Hayling Secondary Schools, with immediate success. The idea arose as athletes from the two schools were already showing their local prowess, and hopes were realised in the sudden expansion of this new Clubs profile. The expectation and excitement of the new Club was ably captured in the monthly newsletters circulated by Mary Batson, a secretary at Hayling School, the information holding the same interest as a weekly comic, and with so many fundraising projects, Mary Davis’s jumble sales, Anne Sainty’s boxing evening, discoes, etc. The ground-breaking efforts of our athletes, coinciding with the acceleration of the world running boom. Whilst the UK had world leading athletes coming through, like never before: Coe and Ovett, Daley Thompson and Alan Wells, we were relating to the hype with our extraordinary young team of winners and champions. The thrill of competing and team work, and the work behind it. From those early days parent recruitment was exceptional, particularly with four sets of parents both coaching, officiating at matches or/and present on the committee, and lasting till their 80’s, and hopefully here tonight. Joan and John Gale, Maureen and John Popplewell and Yvonne and Malcolm Tipton; what a remarkable and long committed service and how very extraordinarily lucky we were. Similarly, about 4 years later we were joined by senior coaches Mary and later Colin Goater, Mary being that much younger……., they managed to last up to the present with Mary coach mentoring still, Colin just having given up the directorship of the Great South Run over many years, and still involved in assisting the Club’s finances with his involvement in the Lakeside 5k Series and Hayling 10. Malcolm, coach, and Pam Rogers, both officiating for decades, assisting our reputation for exceeding our club responsibility with athletic competitions, Pam to UK’s highest level. So many people have played their parts in creating so much general athletic enjoyment over the years. Only a book will serve to do them all justice! Not only our Olympian Tom Buckner, but Zara Hyde and Debbie Noy in the Commonwealth Games and Cathy Bailey as an International, all coached by Colin, but the efforts of all our coaches and athletes. Also, our main statisticians, the late Mark Cawte, and Mike Lloyd, producing the high standard of the Members Guide, recognised as surpassing any other Clubs efforts, as well as editing our monthly Track Record at different times. The MG (not Mary) needs to be up-dated, any offers? And Alan Ive, ex-athlete, coach, officiating and producing our monthly Track Record for so many years. Our ultra able secretary Mike Williams, coach, and warm weather training organiser continues to lead us well, and over so many years now. Another great stalwart was Christine Weeks, who finally sadly succumbed to cancer this summer, who was our so competent Treasurer until fairly recently, the eulogies all mentioning her grace, positivity, and always recognising the good in people. Chairman Mark Scarborough, the only person to have competed for the club for the complete 4 decades, well, except for Vicki Spencer, addressed our 40th party, speaking of any Club’s peaks and troughs and the almost family atmosphere. Yes, we need coaches for the long term, and 50 marshalls at the Hayling 10 on Sunday the 4th November, please. And a synthetic all-weather track would be nice, and so hopeful of it being sooner than later. Time and hecklers won’t allow so many people that have served the Club, so well, to be mentioned, but you, and those out there, know who they are. Please sign up for the 50th and 100th Anniversaries now, to avoid disappointment on the night, as communication will be much improved by then, you’ll probably only have to think of a person to Skype them. Don’t forget, it’s a Thursday, 12th October, 2028. It’s been so enjoyable making the contacts during passing on the word of this gathering tonight. Mainly people who can’t make it, and with the flimsiest of excuses, Jonny Ev in Bangkok, Pat Gale quibbling over the air fare from Cork, Andy Jacob’s at a wedding, Steve Eyre in Albania, many like the Farnhams’ enjoying their holidays. The idea was to finish the speeches with yet another awful inappropriate joke from our first President, Nigel Gordon Rae, as he cut Sue’s cake. A plan that worked out well! Well done to the Havant athletes who ran in the Great South Run 5k and Junior races. In the 5K Joe Wiggins ran well to finish in 48th place with a time of 21:27. In the Junior Boys race Onjoro Sumba had a fantastic run to finish in 8th place with a time of 8:23. Alex Smart finishe in 39th place with a time of 9:24. Chloe Parfitt ran in the Junior Girls race and finished in 31st place with a time of 11:35. A big thank you to all helpers and officials at todays Open Meeting. We were blessed with good weather and a very good entry. Thanks also to all athletes who entered, some having travelled some distance, we appreciate your support. Full details are now available on the RESULTS page. A great team effort for our final SAL match where we finished in second place behind promotion candidates Brighton. Three Club Records emerged from the days competition. Katy Temple broke her own Senior Womens and W35 Club Record for javelin, improving on her old record by 23cm. Simon Gill broke Steve Gallaway’s 1998 M40 Club Record for 2000m steeplechase, knocking 14 seconds off Steve’s record. Full details available on the RESULTS page.